This quote helps me remember that life is a constant evolution. Somedays may feel like we're starting over or we're moving backwards. But the truth is, that is not ever really the case. Even when we "fail", we learn. We adapt. We gain wisdom. We reassess. And we keep moving forward. Speaking of that phrase, Walt Disney was probably one of the coolest people that ever lived! Working for/with the Disneyland family as Sleeping Beauty's "best friend" has been one of the highlights of my life. Even now, his life and legacy lives on and encourages us to seek out imagination and to "keep moving forward". As an homage to Sleeping Beauty, yesterday was my "make it blue" maxi skirt and today is my "make it pink" maxi skirt! Love this coral maxi skirt! Can we say PLEATS?! Pleats are the best because they are so forgiving and flattering! This skirt is pretty high-waisted so I paired it with a loud-printed crop top for a bit of drama! Channeling those island vibes with the beads and bright clip ons and simple leather sandals. 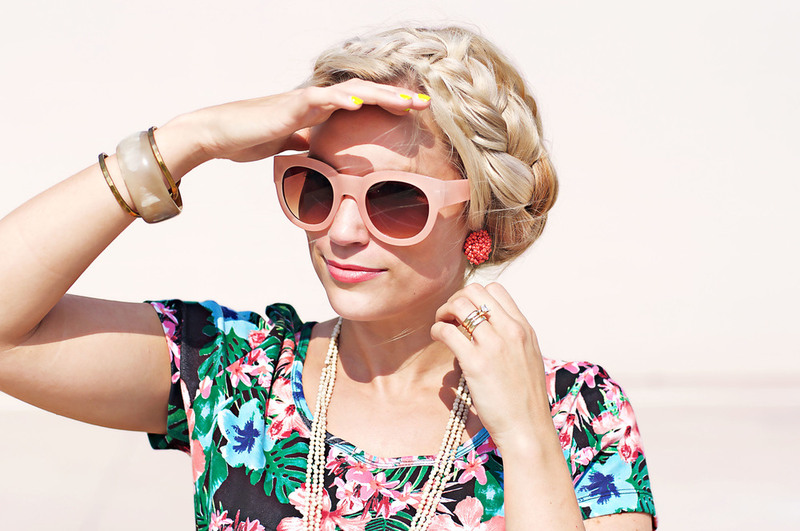 Then adding a pop of pink lips and a big chunky braid completes the look! This braid is super simple to accomplish, tutorial video to follow soon. Unfortunately most stores are transitioning into fall, but come next spring I'm sure J.Crew and Forever 21 will have very similar options to these pieces :).